In ordinary times, Adobe products only see the light of day when they’re ready to land on retail shelves. So it’s a bit of a departure from the software giant’s playbook to make a free beta of Photoshop CS3 available for download. But, with the CS3 release date still months away, and Apple’s transition to the Intel processor complete, the CS3 beta program provides a welcome solution for Mac users who have been hesitant to upgrade their Macs due to a lack of an Intel-native Photoshop. 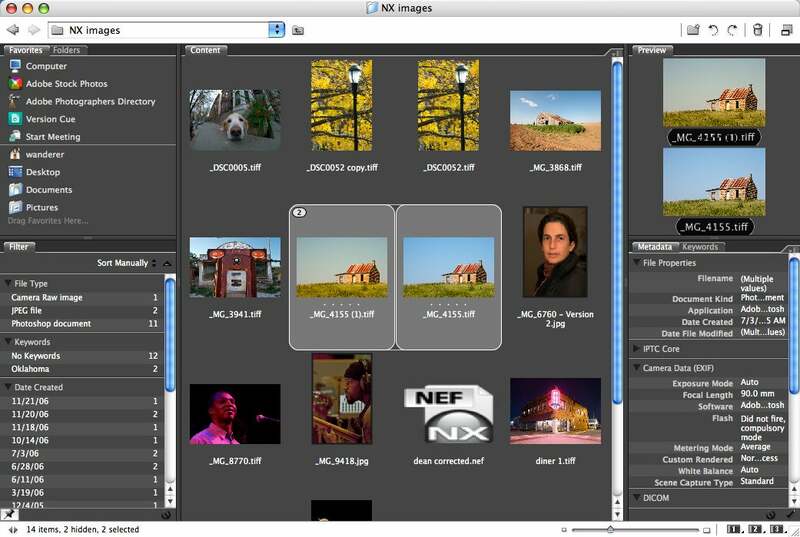 In addition to native compatibility with Intel-based Macs, the CS3 beta also packs a large selection of important new features, including interface changes, non-destructive filters, easier compositing, improvements to Camera Raw, and a completely redesigned version of Bridge, Adobe’s companion file browser. In our initial tests, the Photoshop CS3 beta has proven to be very stable, while offering much improved performance on both Intel- and PowerPC-based machines. Intel users will certainly want to download it right away for the performance increase, but thanks to the program’s stability, most users will also probably find it suitable for production work. Interface-wise, the program’s core features remain unchanged, making it an easy transition for experienced users. While the program is loaded with many new features, most users—particularly those who’ve bought an Intel Mac or are contemplating such a purchase—will initially be curious about performance on Mac Pros, MacBook Pros, and other Intel-based machinery. Overall, the news is very good: Most operations see a little improvement, and some realize a substantial gain. Launching is more than twice is fast, clocking in at 20 seconds on my 2GHz MacBook Pro Core Duo, versus 50 seconds for a Photoshop CS2 launch. In my tests, sharpen and blur filters were more than twice as fast in CS3 as CS2, and I found that these numbers scale consistently with larger images. Other operations such as CMYK conversion and resizing with bicubic interpolation were only faster by a second or two. Macworld Lab is doing more formal benchmarks on the public beta; we’ll publish those at Macworld.com shortly. …allowing you to better manage your screen space. Upon launching, the first thing you’ll notice is the new palette look. By default, the main tool palette is now a single long column of tools, and all the palettes are now bordered by an attractive semi-opaque gray border. The program still offers the same docking mechanism for nesting palettes together into tabbed collections, but with CS3, the palettes that used to reside in the toolbar have now been moved into a second palette dock that sits next to the original dock on the right side of the screen. With two docks, each tab collection is roomier. Photoshop’s interface has been verging on “palette-heavy” for a while, so Adobe has added the ability to collapse a dock full of palettes into a collection of smaller icons. When collapsed, you can click on any icon to display its palette at normal size. For users of small screens, the ability to collapse palettes is particularly useful, while users of large screens will appreciate the second dock, as it will allow them to see more palettes at once. And, for those of you who like the “traditional” two-column tool palette, a simple click at the top of the toolbar will change it back to its two-column state. Smart Filters attach to a layer like a Layer Style. You can also paint a Layer Mask to constrain the effects of your Smart Filters. 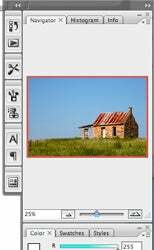 When Adobe added Adjustment Layers to Photoshop in version 4 in 1996, it introduced the practice of non-destructive image editing to Photoshop. The feature was limited to only a few effects, though, so you still had to think carefully about structuring your documents in multiple layers to constrain your destructive effects. 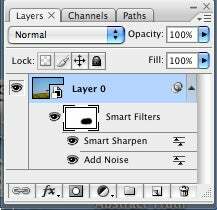 With CS3, you can now attach any filter to a layer as a Smart Filter in the same way that Layer Styles are added to a layer. So, for example, you can add an Unsharp Mask filter to a layer to sharpen that layer. The advantage of a Smart Filter over a regular filter is that at any time you can hide or delete a Smart Filter to disable or remove its effect, or you can double-click on a Smart Filter to change its parameters. Smart Filters also have built-in layer masks, just like Adjustment Layers, so you can interactively paint a mask to constrain the effects of your Smart Filters. While many effects in Photoshop are still destructive—cropping, mode changes, resizing—the addition of Smart Filters should appease many of the non-destructive desires of Photoshop users who’ve been frustrated by the fact that once you apply a filter you can’t alter or undo it later. 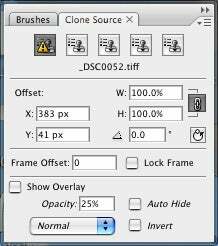 The new Clone Source palette offers numeric control over your clone source and the ability to save multiple clone source points. 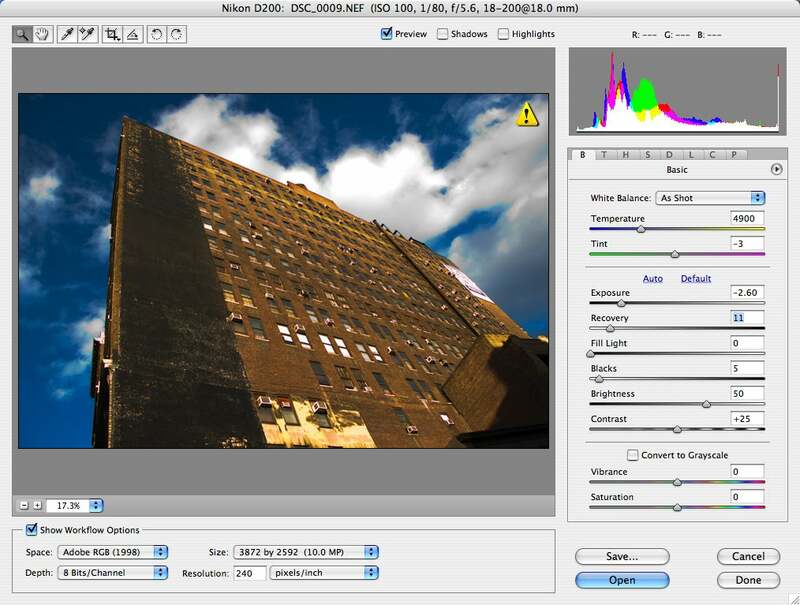 Making selections is a big part of many retouching tasks from compositing to localized correction and filtering. To ease this task, CS3 adds a new Quick Selection brush, which allows you to select an object by simply brushing over it. As you brush, the program automatically analyzes your image to determine which pixels in the region need to be selected. While the Quick Selection brush does not select very fine details (blowing hair, for instance) or handle transparency, it can do an amazing job of quickly selecting an object off of a similarly-colored background, something that’s difficult to do with Photoshop’s other selection tools. No matter which selection tools you use, the new Refine Edge palette, which replaces the Feature Selection command and lets you interactively apply feathering to soften the edge of a selection, and expand and contract the selection. In addition, a new Radius slider can often greatly improve the accuracy of your selection. The Refine Edges also lets you preview your selection over a variety of backgrounds. With the new Quick Selection brush, you simply brush on an object in your scene, and Photoshop automatically selects it. Many other changes and improvements abound throughout the program. The Curves dialog provides a new Preset feature as well black-and-white point sliders. A new Black and White adjustment gives you a 6-channel color mixer, and Brightness & Contrast now performs its adjustments more intelligently—preserving the tonal relationships in your image while making alterations, rather than simply sliding the entire tonal range back and forth. Be warned however, that in this beta, cursor display is a little buggy. On Intel Macs, you won’t be able to see your brush size when painting. Precise display is all the current version can manage. This will be fixed by the time of the release version, but if you depend on precise cursor display for painting and retouching options, you may find that you need to go back to Photoshop CS2 for those features. Fortunately, you can have CS2 and the CS3 beta installed on the same machine with no conflicts. Included with the CS3 beta is the newest version of Camera Raw which offers features that are new to Photoshop, but that users of Lightroom will recognize. 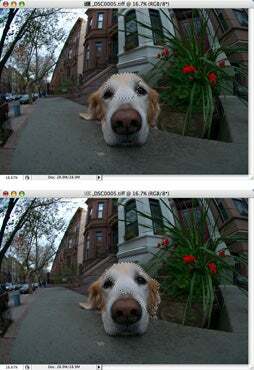 Camera Raw 4 now includes the same Recovery, Fill Light, and Vibrance sliders that you’ll find in Lightroom. Lightroom’s slider-based curve editor has also been added to Camera Raw, along with Split Toning and a grayscale conversion option. While none of these features will be new to Lightroom users, for those who’ve been enjoying the raw tools in Lightroom, but haven’t wanted to give up their Bridge/Camera Raw workflow, this will be a very welcome addition. And speaking of Bridge, Adobe has completely revamped the program with a new, more modern-looking interface. 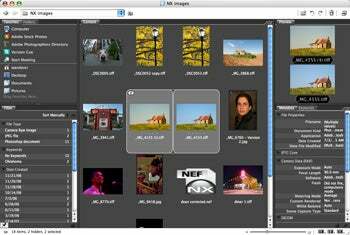 Significant changes include the ability to view multiple images side-by-side and to create Aperture-like stacks—groupings that allow you to easily keep related images together within the browser. Many aspects of Bridge’s interface have been streamlined, but its basic feature set remains the same. For those who have been wondering about Bridge’s purpose now that Adobe is developing Lightroom, the new version should reinforce the roll of Bridge—and its ability to drive automated batch processing of raw files—in a Photoshop/Camera Raw-based workflow. Upon first downloading the package, most Intel users will simply be glad to have a Universal version of Photoshop, and will probably be eager to test performance. If Adobe had done nothing more than release a Universal CS2, many users would probably be happy. Within a few days of playing with the new features, though, you’ll probably forget all about your previous performance concerns. The download is available for free for registered users of Photoshop CS2 and can be downloaded here. At approximately 750MBs, it’s not a small file transfer, so you might want to leave the download running overnight.